KEONYS has been the partner of reference for PLM (Product Lifecycle Management) and 3D solutions. Working at the heart of digital business, KEONYS enables organizations of all sizes and in all industries to create improved products and innovative services and speed up their time-to-market. In 2017, KEONYS joined the CENIT Group to become the number one Dassault Systèmes reseller worldwide. With the addition of KEONYS, the Group has more than 800 employees and 27 agencies located in eight countries (on three continents). Since more than 30 years now, CENIT Group accompanies companies towards digital transformation. Joining forces with KEONYS and SYNOPT, CENIT Group gathers all the Dassault Systèmes’ best-in-class PLM and Cloud experts to leverage industrial software solutions into your company. WE ARE your right partner for digital transformation, and we cover the wider range of Dassault Systèmes software in the world : CATIA, ENOVIA, DELMIA Apriso, DELMIA Ortems, SIMULIA, ABAQUS, 3DEXPERIENCE on premise, 3DEXPERIENCE on Cloud. The Industry of the Future is at the very heart of new industrial practices that enhance innovation and productivity. This transition is disrupting all sectors and bringing about organizational transformation. As an actor in the Industry of the Future, KEONYS provides value-added management consultancy and change management services to make sure that the integration of PLM projects goes hand-in-hand with productivity, growth and enhanced employee skills. “Our mission is to help companies modernize with our expertise in the integration of digital solutions. The enthusiasm and expertise of our teams helps us establish creative, collaborative and long-lasting relationships with our customers. Whether for startups or major groups, our aim is to offer a fresh approach and establish new industrial processes in order to jointly build a sustainable, human and effective business model.” Martin Grunau, Chief Operating Officer. KEONYS is committed to modernizing production tools in France. As an actor in the Industry of the Future (Industry 4.0), KEONYS is involved in many regional projects to raise awareness of digital tools and spread their use within small and medium-sized companies and industries. Keonys promotes discussion about digital transformation through its involvement in conferences, roundtables and events in France. As part of Syntec Numérique’s Industry of the Future Committee, KEONYS also helps develop projects addressing the place of people in tomorrow’s industry. At a time when digital is disrupting and transforming industry, people are at the center of new forms of value creation. How to support the acquisition of new skills or the transition into new jobs? These thoughts are shared with numerous actors in the ecosystem – institutions, industrial companies, integrators and academics – in order to come up with and provide new training courses that meet the needs of the Industry of the Future together. Distribution and integration of Dassault Systèmes PLM solutions: CATIA, DELMIA / Ortems / Apriso, SIMULIA / Abaqus / TOSCA, 3DVIA, ENOVIA, 3DEXPERIENCE® platform. Consultancy, for a structured approach to analysis, methodology and proposal development throughout the project lifecycle. From needs analysis through to deployment and integration, we have developed our four areas of expertise (avec lien) to track and successfully implement all key project phases, using our engineering and software skills in design, simulation, production, data management and collaboration. KEONYS is an approved training center and a certified Dassault Systèmes Gold Partner. More than ever, professional training is at the core of future industrial and societal challenges. The role of people is at the center of these new considerations. Digital technologies shaping the Industry of the Future must be aimed at freeing people from tedious and repetitive tasks, in order to be able to focus on more meaningful work. Jobs will disappear, while new ones are created. How to help employees move into new roles with more added value? Learning how to use digital technology to build the Industry of the Future is a major challenge, which lies at the heart of our approach. KEONYS helps you resolve all issues related to the installation, administration or use of your software. In order to do this, we provide several assistance solutions, over the phone (call center), on-site or remotely, within the framework of our technical support contract. Our experts provide responsive assistance for all the PLM solutions you select. Among these services, you can request assistance from PLM consultants for the Dassault Systèmes 3DEXPERIENCE® platform, including the CATIA, DELMIA, SIMULIA, ENOVIA and 3DVIA software ranges. We can also provide assistance for IT problems (computer installation and PLM server administration). “Industrial players are looking to think, design and collaborate with all of the stakeholders involved in a project. Dassault Systèmes’ collaborative 3DEXPERIENCE® platform offers a single solution to manage all of your project’s technical data. The various teams involved can collaborate in real-time, using a unified platform. Using configuration and modification management applications, our customers enjoy full control over complex changes and product optimization, throughout the development process. It is the mission of our project teams and experts to assist industrial players with the definition, implementation and operational support of their solutions.” Alain Gaillard, France and Benelux Services Director. Including high schools, technical colleges, universities and engineering schools, KEONYS has developed a technology and cooperation network with the academic world. Basic training in digital technology is a key part of social integration. Dassault Systèmes solutions are currently used and deployed by KEONYS in more than 300 establishments. The transition to Dassault Systèmes 3DEXPERIENCE® platform is well underway. New organizational modes are impacting uses, which are increasingly moving toward the development of collaborative, multidisciplinary and multi-site projects, involving various campuses or in coordination with industrial sites. KEONYS and Arts et Métiers ParisTech linked up in 2013 to jointly create the IngeNUM specialized master’s degree – Manager in Building and Product Digital Engineering, a six-year post-secondary course that aims to help the engineers of tomorrow specialize at the highest level and position them as key actors in industrial transformation and innovation. Six months on campus followed by six months in internship offer students extensive experience at the heart of the new digital industry. Each year, KEONYS welcomes interns who are rapidly integrated in our project teams. They are given opportunities to discover, learn about, analyze and set up industrial processes that are the most suited to our customers’ strategic challenges. With this experience, their internships also lead to full-time job opportunities. 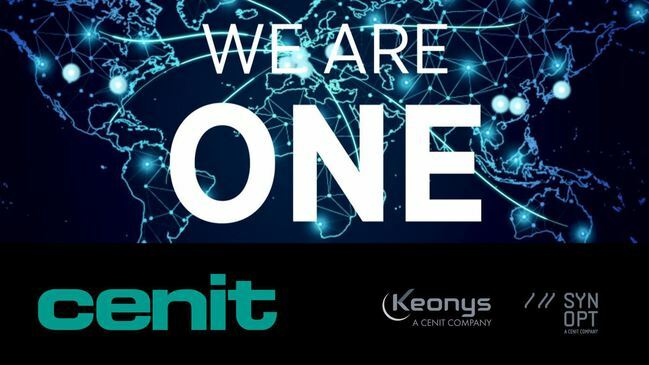 KEONYS joined CENIT Gmbh (LIEN CP) on July 1st 2017. A listed company, the CENIT Group is Germany’s leading software and IT consultancy provider. The two merged entities became the number one Dassault Systèmes reseller worldwide. The pooling of their expertise has also made them Europe’s leading player in the popularization and deployment of Dassault Systèmes’ 3DEXPERIENCE® integrated platform. “Our vision is that of a stronger group, better able to respond to the needs of its customers and strategic partners. By continuing to place the customer at the heart of our concerns, we will be able to establish our position as an international leader” – Kurt Bengel, President and CEO of CENIT AG.